"A fresh, peachy sweet tea that's perfect for hot summer days. I am definitely NOT a fan of sweet or flavored tea, but I came up with this concoction on accident, and LOVE it. Remember, the amount of alcohol you want to use is up to personal taste. I personally use a little more vodka than peach schnapps. I just like a touch of the peach flavoring." Fill a tall glass with ice. Pour iced tea, vodka, and peach schnapps over the ice. See how to make a sweet Southern refresher. this is great! tastes just like peach iced tea! i used 360 peach flavored vodka for an extra peachy taste! 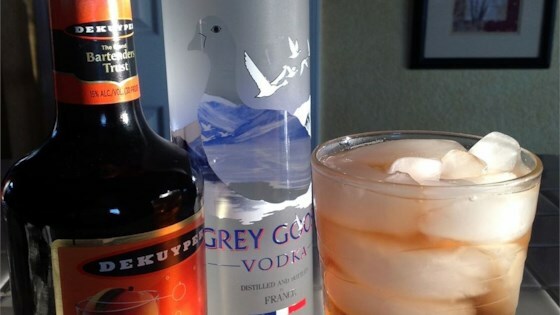 This was delicious, like you I added a little more vodka than peach schnapps and it was great. Thanks for this recipes, I will be sharing this one with my friends. Oh, boy......is this TASTY! Both my husband and I give two thumbs up for this beverage. Yeah this was really good. I have been making this for about 30 years. I like fuzzy navals but the o.j kills my stomach. I dont drink much but when i do this is my drink of choice. Quick to make and quite refreshing. I added a bit more vodka.